Looks like summer has arrived on Larvotto Beach. Hope it stays. The "sand" looks like after the rain. Nevertheless I wouldn't mind being there now! Beautiful beach and wonderful weather. I agree, the sand has an unusual pattern on it, but I think maybe it's just from the tide recently receding? Do you mind if I save the picture? This picture is serious contest for the corgi puppy picture I use as my desktop wallpaper. Never got that far. Maybe next time.. 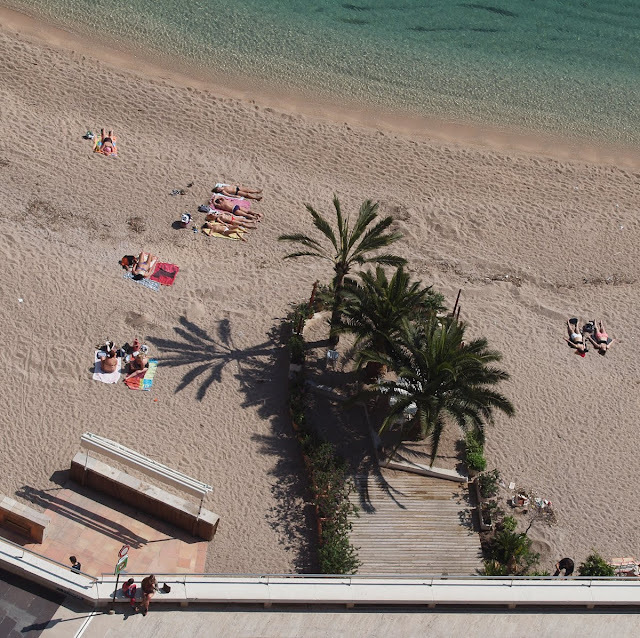 I particularly like the shadow of the palm and the subtle, curving transition from beach to sea. Of course, I think lying out in the sun like that is crazy. WB, of course you can and thanks for asking. Gailsman, we drove along Larvotto Beach and you were right by it when you went to the Grimaldi Forum. Had you walked just a short way further you'd have seen the bay and the beach. Jilly this is so much fun! The little people on the right with their arms outstretched look like caricatures of sunbathers - in fact the others on the left lying flat on their stomachs do too!!! Then the palm trees with their shadows in the middle... there's so much to look at in this photo, I just LOVE IT!